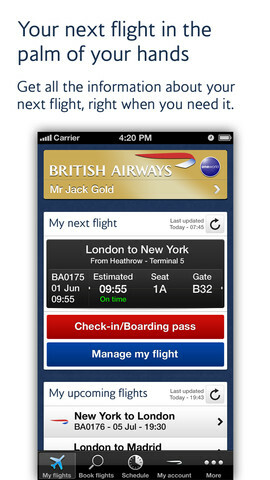 British Airways integrates the mobile passbook application for iPhone to manage passenger boarding cards. British Airways is the latest airline to integrate their boarding pass at the Apple passbook application, to facilitate the boarding procedures. After downloading the boarding pass on their mobile phone, passengers may add to Passbook, a virtual wallet that stores movie tickets coupons, through gift cards and boarding passes, preprogrammed in all iPhone. This app also allows you to scan the phone for virtual check-in, and can be used in more than one hundred airports relaying British Airways worldwide. To avoid last minute research and access simply flight boarding pass on phone will automatically appear on the idle screen of the iPhone for three hours before departure. Air Canada, Alaska Airlines, American Airlines, United Airlines and Lufthansa are also partners in passbook application.